A unique collection of early adaptations of Britain's favourite author. 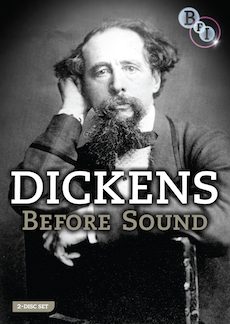 Inspired by the popular success of the BFI's Silent Shakespeare films, Dickens Before Sound is a unique collection of early adaptations of perhaps Britain's favourite and (after Shakespeare), most adapted author. Almost one hundred film versions of Dickens's stories were made before the coming of sound, predominantly in Britain and the USA, but also in countries such as France, Italy, Russia, Germany and Denmark. Sadly, only about a third of them are known to have survived and have rarely been seen. This collection of films, the majority of which are previously unreleased, shows how early cinema storytelling developed, as practitioners of this wonderful new art struggled to transform a tale from page to screen. This DVD includes the first existing Dickens adaptation, Scrooge; or Marley's Ghost (1901) photographed a mere thirty-one years after the author's death; an entirely original attempt to animate a series of original lantern slides depicting the story of Gabriel Grub; the first Dickensian sound film with Bransby Williams as the character Grandfather Smallweed from Bleak House, and perhaps the centrepiece of the collection – a version of Oliver Twist (1922) featuring two iconic performers of the silent screen, Jackie Coogan and Lon Chaney.